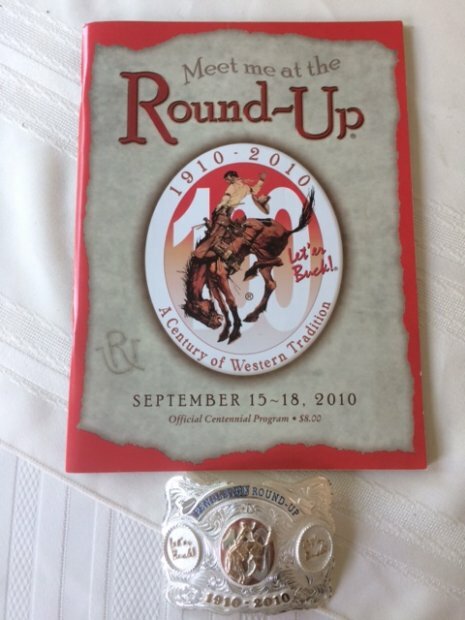 100th Anual Pendleton Round-Up, # 216/500, made by Skyline Silversmith, with Souvenir Program - $100.00 + shipping. Shipping by USPS Priority Medium Flat Rate Box, $13.65. 1. "RE: Another $ Drop Rodeo Buckle"
You might have a better chance at selling your buckles if you can post some pics. Maybe Founder can help you out with that if you aren't sure how. Good luck! 2. "RE: Another $ Drop Rodeo Buckle"
Hi B2hunt, I have 1 buckle left and the picture I have is on email. I have an old computer so I can't post the picture to the forum. PS - This is a special buckle (100th annaversity) that I was asking $300.00 for and is now down to $100.00. That's a good deal! 3. "RE: Another $ Drop Rodeo Buckle"
You have a flip phone ? 4. "RE: Another $ Drop Rodeo Buckle"
264MAG, you are talking to a 78 year old former hunter that doesn't even have a TV! As you can see, I don't know much about electronic stuff. To me "high tech" are two 4 letter words!!!! 5. "RE: Another $ Drop Rodeo Buckle"
6. "RE: Another $ Drop Rodeo Buckle"
7. "RE: Another $ Drop Rodeo Buckle"
That is a beautiful buckle. 8. "RE: Another $ Drop Rodeo Buckle"
I�ve got to ask, who wears someone else�s rodeo buckle? 9. "RE: Another $ Drop Rodeo Buckle"
Hbean, When I was younger, I really liked going to rodeos. I wanted to go to the 4 largest outdoor rodeos, Chyenne, Salinas, Pendleton and Calgary. I made it to 3 of them and bought a buckle and souvenir program as a remembrance of the rodeo. I did not buy them to wear. I wear a buckle of my local rodeo, Livermore, 75th anneversity. I sold the Chyenne buckle to a man in NM that bought it for his daughter, whose name was Cheyenne. I sold the Salinas buckle to man in OR for his son. The Pendleton buckle is special because its the 100th annivesary of the rodeo. I hope I sell it to someone that the Pendleton rodeo means something to them. 10. "RE: Another $ Drop Rodeo Buckle"
11. "RE: Another $ Drop Rodeo Buckle"
12. "RE: Another $ Drop Rodeo Buckle"
13. "RE: Another $ Drop Rodeo Buckle"
14. "RE: Another $ Drop Rodeo Buckle"
15. "RE: Another $ Drop Rodeo Buckle"
16. "RE: Another $ Drop Rodeo Buckle"
17. "RE: Another $ Drop Rodeo Buckle"
18. "RE: Another $ Drop Rodeo Buckle"